Home in Yellowstone at last! I have reached the destination of my wildest dreams. Oh what a wonderful feeling it is! To be enveloped in this land and this place at this time in my life, a well planned whim. Here I am! I am home! I reached my new house in Bozeman on December 23; my life partner Genevieve and our newborn son River arrived on December 28. 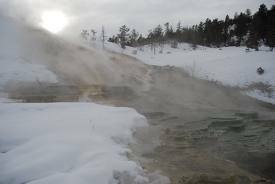 Now, finally, on January 14, I made it into Yellowstone National Park for the first time, although I only went as far as Mammoth Hot Springs. But, ecstasy is mine, and the sulfur air is sweeter than the sweetest smelling flowers. Today began like so many days, early at 6 AM, where I popped out of bed and go to work. What's different these days is that I can go to work immediately from home in my office. Yet, at the end of 8 hours, it still feels like work. The difference has been that I can climb the nearby hill and watch the sunset, walk a block and see mountains all around me. It's wonderful, but as the days have gone on, my heart wanted to see the wonders I remembered. Each day that I thought that we might make it, we would have snow, or something else would come up. We haven't yet put snow tires on the car, and we worried about the drive with the baby lacking good tires. A weekend ride into the Bridger Mountains was scary enough with simply slush on the road. One slide might be the end of you on a mountain road. As I sat looking at my work, on a whim, I looked at the road conditions. To my surprise, the road from Livingston to Gardiner into the park was completely dry. It said "high winds," but it was warm, and the drive was there for the taking. So, I rushed to get done with work. I coaxed Genevieve into the 70 mile ride to the North Entrance, and before you knew it, off we were, over Bozeman Pass, to Livingston, and south to Yellowstone. Every mile was stunning, each turn ... mountains, snow, canyons, the way that light hits places it doesn't seem it should hit. The only problem was the "high winds," which seemed to be picking the car up to throw across the road. I wondered if the high wind was going to be a door to keep me shut out of the place I loved. Determined, I slowed down, took my time, and threw some caution at the wind. I felt so close I could taste it. The mountains were just unbelievable; Genevieve was in awe. As we passed into Gardiner, she said that this is the town she wanted to live. It took her 30 seconds to be convinced that this was her sort of town, the place to be, even though none of us knew how we'd find work in Gardiner (which is exactly why it's still the small, beautiful quaint town that it is - I can't believe that the phone company wants to build a cell tower right smack in the middle of one of the most scenic little towns in the world). We stopped in Gardiner for a moment; there were three mule deer on the other side of the fence separating Yellowstone National Park from Gardiner. Soon, we were entering. I can't begin to express the euphoria, the joy, the childlike wonder I never even had as a child. One can scarcely believe that such a place exists, and no one could imagine it unless they saw it. Not more than a moment after entering the Roosevelt Arch, inside of Yellowstone at last, there I saw something I personally hadn't seen in all my years in Yellowstone, though I knew they were there. There were pronghorn all over the place. I had seen plenty in South Dakota, along the freeway in Wyoming, but for some reason, I had never seen them inside the park. It was a welcome present, though had I only seen the snow and the mountains around me, that would have been enough. I have rarely felt such highs on the most romantic evenings in my life (of course, some of them were under the steam and moon in Yellowstone). Just down the road, we stopped at the parking lot for the Boiling River, which I had last seen a couple years before on my hiker/biker trip. We were the only ones there. There, we bounced out of the car. I carried River all the way down the trail while I showed Genevieve a place she had never seen before except in pictures she did not remember. In the middle of winter, there is a place you can swim in hot waters. Plant life grew in the thermally heated waters along the very cold Gardner River. The trail only had the minimum of snow, sometimes not at all. We did see an unusual track in the snow of an animal we couldn't identify. We couldn't believe we were in this huge paradise all by ourselves. Even when I first came to the Boiling River in 1993 in the middle of the night, I was with more people than I was today with Genevieve and River. Eventually, we went back up to the car and up to Mammoth Hot Springs for a brief visit. I ran excitedly up to Palette Spring, which just 2 1/2 years before had a trail on it that Genevieve and I walked over. The next summer when I was hiking and biking through Mammoth, the spring had taken over the trail. Now, over 15 months later, the spring has the most beautiful terraces spreading over an area that used to be covered by a trail. The change was stunning and awe inspiring, but it was unbelievably gorgeous. It seemed to sum up in a nutshell the great changes I was making in my life. I couldn't believe I was now in a place where I could work my own hours and on a whim just head on up to Yellowstone with my cherished loved ones. There was no planning now; all those plans led me to a place where I could playfully choose to come here when I wish (and when I get the snow tires on, just wait)...and it's even better than I imagined. Of course, there are serious thoughts here and things seriously amiss even in this picture, but today, I have to get strength and inspiration from the joy and magic of a place that brings out the very best in me. I love you Yellowstone!!!!!! (I shouted that as loud as I could at one point; I have no doubt that neither you nor even the wildlife heard me).